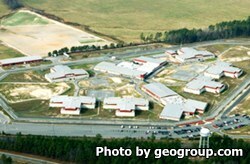 Lawrenceville Correctional Center is a medium security prison operated privately by The GEO Group, Inc. Inmates are housed in six double celled housing units. An additional unit is designated as a residential substance abuse therapeutic community. All inmates are provided medical, dental and mental health services. Inmates who do not possess a diploma can take adult basic education classes, and earn a GED during their incarceration. Vocational training at Lawrenceville Correctional Center includes computer courses, electrical wiring, horticulture, carpentry, commercial cleaning, masonry, and plumbing. The visiting hours at Lawrenceville Correctional Center are currently unknown, contact the institution for more information. If you know the visitation times for this facility please leave a comment below.